It isn’t for the faint-hearted. Few places on earth can echo the harsh, alien environment of the Himalayan mountains in the winter, and fewer still are the number of people who live there. Those who do, the Sherpa of Khumbu, are as rugged as the steep cliffs they count as home. As with all cultures, their children hold the future of the Sherpa’s way of life in their hands. With that in mind, how do the Sherpa people ensure their children’s ability to thrive when their access to education and technology is often limited? A group of industrious Microsoft engineers and program managers from the United States, Hong Kong, Istanbul, France, and Canada believe bringing technology to them will empower them to start to answer this question and, along the way, hopefully begin their journey to leap across the opportunity divide. Mandy Yeung from the Microsoft Core Services Engineering and Operations (CSEO) joined the team from Hong Kong to participate in this trip. She talks with a student from the Lukla Primary School in a remote region of Nepal. 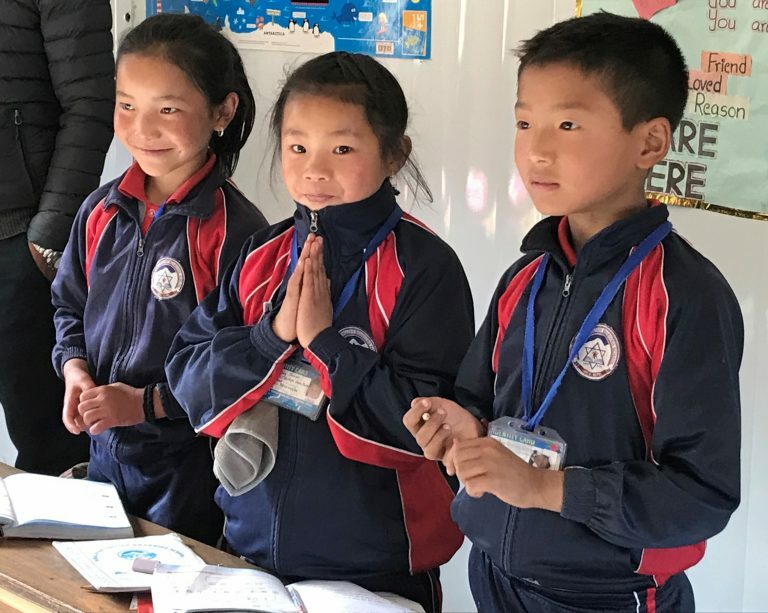 A team led by Doug Pierson from Microsoft Core Services Engineering and Operations (CSEO) just returned from a visit with schoolchildren who live in remote villages in Nepal. Climbing as high as 15,160 feet above sea level, the team hiked from Lukla to Farak Peak, and back again, a seven-day roundtrip. They brought Microsoft technology and school supplies to villages, schools, and monasteries in the Khumbu Region of Nepal, including 40 Microsoft Surface 3 tablets. Every step was another groan of the foot and back, and another gasping breath in the thin air. Jagged cliffs and rocky terrain pushed the crew to its limits, something they were only able to get through by relying on each other. Even for a trained U.S. Marine like Pierson it was challenging, and even more so for his companions. Accompanying him were Alex Agudelo, Claire Sisson, Darren Moffatt, Mandy Yeung, Orhan Topcu, Robert Koester, and Ugur Yilmaz, all of them experts within their respective technology-related fields in IT, gaming cloud, and global security. They were assisted on their journey by Mark Gunlogson, who they partnered with and is president of Mountain Madness, and Chappal Sherpa—their very skilled guide of this rough terrain. Helping young students in such a remote location showcases the culture and mission of Microsoft to empower every person and every organization on the planet to achieve more, Pierson says. This is not the first global citizenship mission Pierson has led on behalf of CSEO. Over the past eight years, he and a core team of his colleagues have traveled to and in support of nonprofits from Cambodia to Los Angeles on trips focused on children’s education and empowerment. Read this story on how the team traveled to Thessaloniki, Greece, to support a camp of Syrian refugees. Moments like taking a pilgrimage through the tallest mountains in the world. The journey to Nepal added a new challenge that set it apart from the team’s previous travels. A truly raw, physical trial with every step they took, every single member of the team needed each other to push through to the end. From having to weave their way around yaks and mules, to crossing a hanging bridge that swung back and forth 100 meters above the Dudh Khosi River, to coping with weather that changed moment by moment, the team took nothing for granted. Students at the Lukla Primary School prepare to meet visitors from Microsoft. All of this was worth it when they reached the children. Excited to have visitors, Sherpa children from each of the villages they visited were consistently eager to show their proficiency in English, giggling as they willingly spoke with the team, offering local foods to the group with giant smiles. The team stayed at each location long enough to make sure that supplies were set up for use, any questions were answered, and school administrators understood how to work with their new devices. As a karmic bonus, the team returned home with new mindsets and perspectives to share with others who work in IT at CSEO and Microsoft at large. This is often the result of creative, on-the-spot solutions to technical problems that the group comes up with on these trips, solutions to challenges that may not be encountered by people who have access to affordable and reliable technological services, Pierson says. In the Khumbu region, electricity itself is not something that can be accessed whenever it is desired—it is expensive, and often the wires and other electrical infrastructure is faulty or not functional. “We see issues in more remote locations that we may not anticipate, as they don’t have access to all of the technological conveniences that we’ve grown accustomed to,” Pierson says. For example, the lack of a consistent supply of electricity and internet connection in the Himalayas can mean that using cloud services isn’t an option. Seeing these kinds of challenges first-hand can help Microsoft employees think about how to plan for them when building the company’s products and services back in Redmond. All the members of the team say it was a unique and rewarding experience to travel deep into the Himalayas as a way of giving back. They say they have been deeply affected by how the Sherpa people take nothing for granted. A common phrase used in the Khumbu Region that resonated with them is the Buddhist notion that ‘nothing is permanent,’ a mindset that lends itself towards growth and resourcefulness. The team also took away another Buddhist learning, one thought to be Buddha’s last words in ~400 BC, which was “do your best.” “That’s a fitting message for us all, no matter where we are, and no matter what we do for this incredible company that we are all a part of,” Pierson says.